I made this vegan broccoli soup on a whim a few weeks ago when I was playing around some infused avocado oils I received. It turned out so yummy, I knew I had to make it again so I could write down the recipe for you guys. And don’t worry if you don’t have infused oils because I have options for regular olive oil/avocado oil and even oil-free too (the soup – not the croutons). I LOVE smoky flavors. Especially in red wine, but that’s another post. I have a total of 7 recipes on the blog already that start with the word Smoky (snacks, burgers, dips, pasta, etc.) and countless others that contain the smoky flavors, just not in the title. My favorite spice to make things smoky is smoked paprika. I love liquid smoke too. 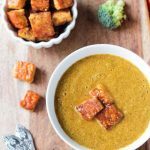 For this broccoli soup recipe, I use smoked paprika, chili powder and just enough ground chipotle peppers to give it a kick without being spicy. 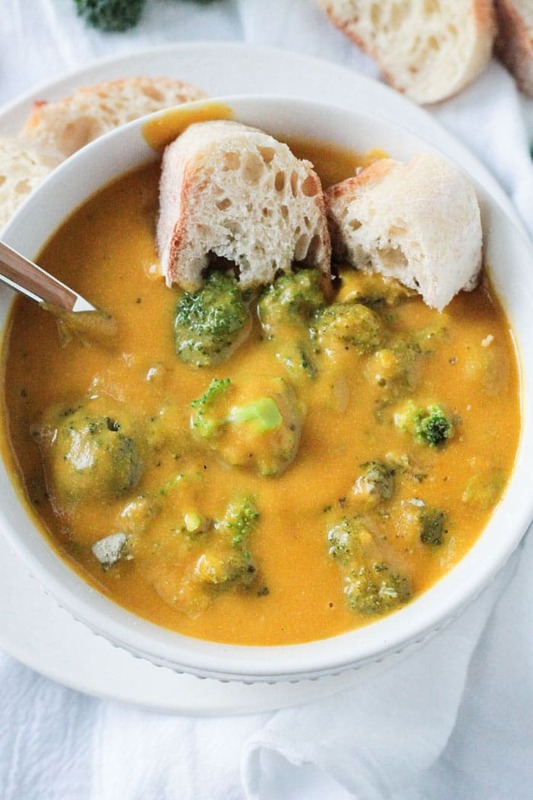 This soup comes together easily with not too many ingredients. 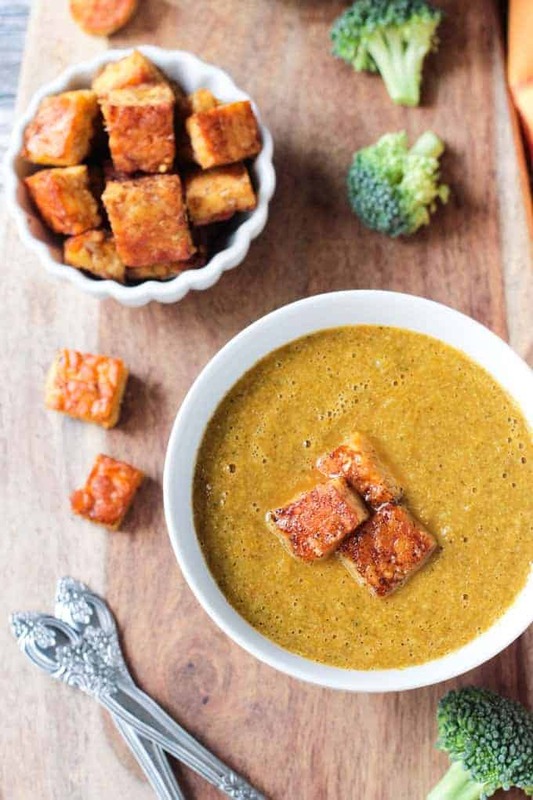 If you time it just right ~ and I give you instructions below to do just that ~ you can have the soup and the tempeh croutons ready in 30-35 minutes, making this vegan broccoli soup a delicious, nutritious lunch or weeknight dinner. Tempeh is a pressed rectangular cake or patty made of fermented soybeans. It has a nutty, chewy texture and works wonderfully as a stand-in for meat. Some people find it tastes bitter, but steaming it first usually mellows out that bitter flavor. It can then be baked, fried, roasted, or even just crumbled and used as is. Tempeh can definitely be made gluten free, but it’s often combined with grains like wheat or barley. If you’re following a gluten free diet, be sure to read the labels to choose an appropriate brand. Both tofu and tempeh are made from soybeans and both are delicious if prepared well. Tempeh is less processed than tofu and is slightly higher in calories, but it also contains more protein (almost double!) and more fiber. Tempeh, like tofu, is high in calcium, but tempeh boasts probiotics, due to the fermentation process, that tofu doesn’t have. In general, tempeh is touted as the healthier choice between the two. Either way, make sure you choose organic as most soy nowadays is genetically modified. These tempeh croutons are crispy on the outside, dense and chewy on the inside. Tofu could be used in place of the tempeh for these “croutons” if you prefer. No need to steam the tofu, just press, cut into cubes and pan fry according to directions below. 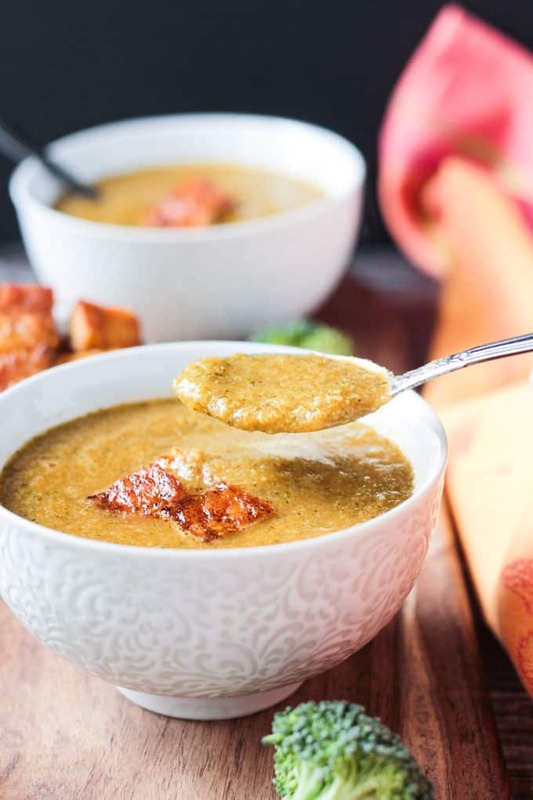 I hope you love this Smoky Vegan Broccoli Soup as much as we do. If you try it, please come back and leave me a comment with your feedback and star rating. 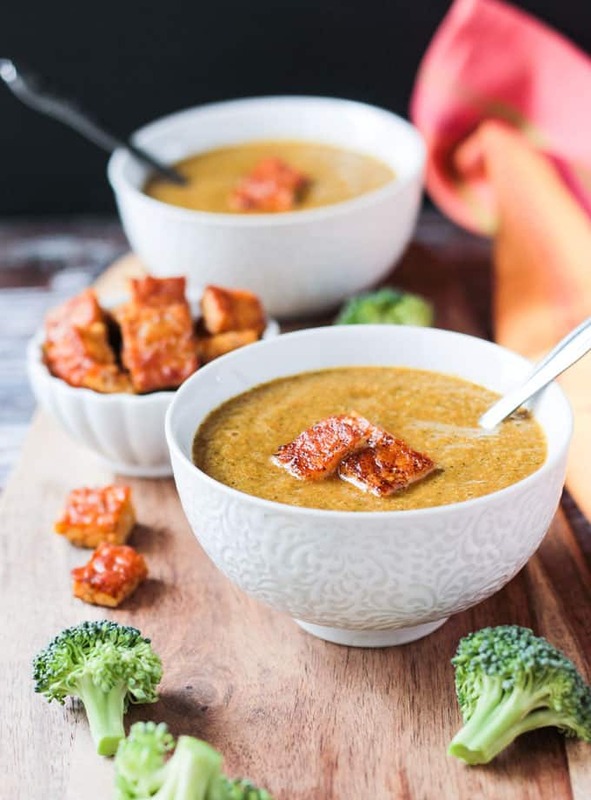 Smoky Vegan Broccoli Soup - Not your average broccoli soup! 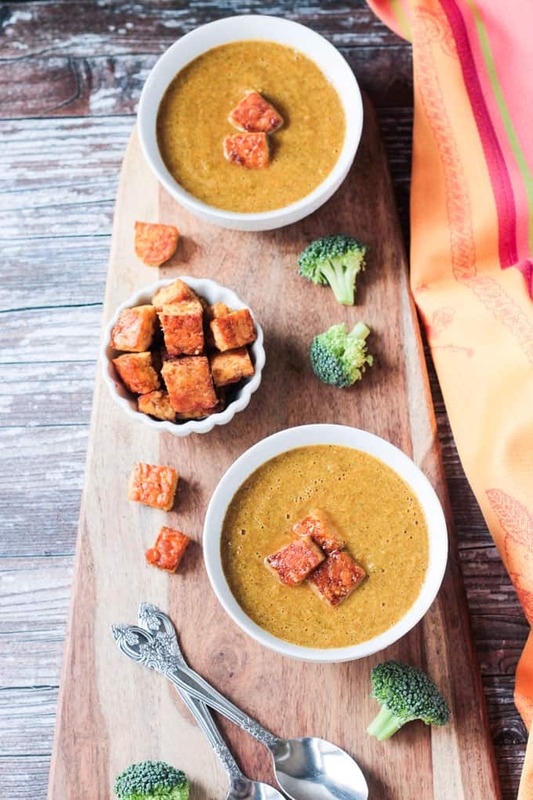 This quick and easy soup is healthy, smoky and comes with addictive tempeh "croutons." If you are making the tempeh "croutons" - start steaming them before starting on the soup. Then in the last few minutes the soup is simmering, start pan frying the tempeh. See below for instructions. In a soup pot over medium-high heat, sauté the onion and celery in 1/4 cup vegetable broth (or 1 tbsp oil) for 5 minutes until starting to soften. Add the minced garlic, smoked paprika, chili powder, salt and pepper and sauté 1-2 minutes. Add the chopped broccoli and remaining 3 cups vegetable broth. 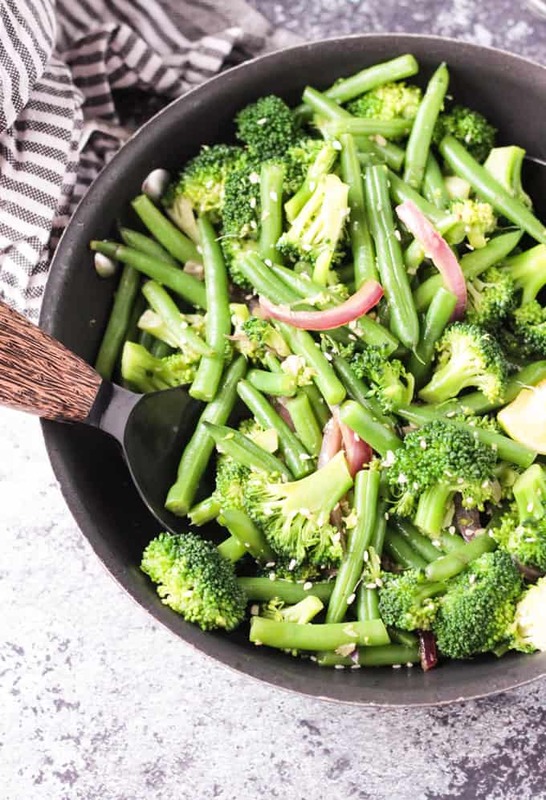 Bring to a boil, reduce heat to medium-low, and simmer for 15 minutes until broccoli is tender. In a large skillet over medium-high heat, add 1 tbsp oil, smoked paprika, and chipotle powder. Stir to combine. Add the cubed/steamed tempeh and pan fry for 3-4 minutes until golden brown. Flip the pieces over and fry another 3-4 minutes. Add another tbsp of oil when you flip them if the pan is dry. 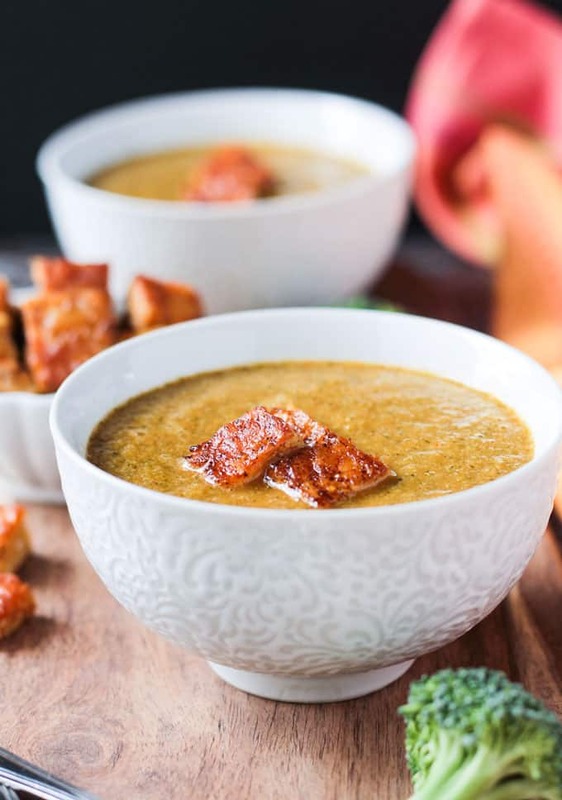 Ladle the soup into individual bowls and top with several tempeh "croutons." (The tempeh croutons will start losing their crunch once they hit the hot soup, so add them just before serving**). *I originally made this recipe using chipotle infused avocado oil which adds yet another level of smoky flavor. Ahuacatlan makes a great one! If you don't have that, regular avocado oil, coconut oil or olive oil will work. **The smaller the you cut the tempeh, the crispier it will get when pan fried. You had me at crispy tempeh!! Adding in the soup and I’m craving this right now!!! I’ve been so into tempeh lately! And I love the texture of it in this silky soup. Thanks, Anjali! I loveeeee broccoli, this sounds delish! This is amazing Jenn! I love anything and everything with smoked paprika, so I’m sure this would be a winner in my book. Can’t wait to try it. It’s my favorite spice! Thanks, Jen! You know I like smoky flavors, and this is making my mouth water! I love everything about this recipe, Jenn. Pinning for later! Thanks, Linda! Smoky flavor lovers unite!